The New Hiram Hounds Dog Park is Now Open! You may have heard that the City of Hiram acquired Homer Leggett Memorial Park next to the Silver Comet Trail on Seaboard Avenue. One of the reasons the City sought ownership of this park was to build a dog park for our residents and visitors. Many locations were discussed, but Homer Leggett Park made the most sense as it is situated near a captive recreational audience using the Silver Comet Trail with proximity to parking. 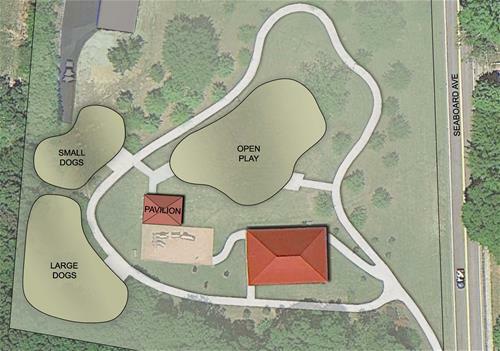 The actual dog park facilities are located at the rear of Homer Leggett Memorial Park behind the existing concession and bathroom facility and adjacent to the train facsimile playground. There are three separate fenced-in areas for dogs, with three categories of activities. There is a fenced in area for open play for dogs under 35 pounds, one for dogs over 35 pounds and one large area for open play for dogs of any size. Although all areas will be used at the owners’ risk, the latter will be open to animals of all sizes under the discretion of the owners. Each fenced in area has a secured entrance with two separate gates. One gate allows entry into the area that has access to the second gate that takes the owner and pet into the open play area reducing the chance of escape. The 35 pounds and larger area is estimated at approximately 6,400 square feet. The 35 pounds and under is estimated at approximately 3,813 square feet. The open play area is estimated at approximately 16,577 square feet. Eventually, the City would like to work with our community partners and volunteers to acquire or build some agility equipment for the dogs as well as provide some water stations, benches, and other amenities for the patrons and their pets. If you would like to support this effort in any way, whether monetarily or with sweat equity, we would love to hear from you. You can reach the city at 770-943-3726 ext 2001. From Left to Right: Paulding County Post 3 Commissioner Vernon Collett, Hiram Councilwoman Post 5 Kathy Carter, Former Councilman Post 1 Pep Rollins, Former Mayor Doris Devey, and Mayor Pro Tem, Councilwoman Post 2 Kathy Bookout.